the child’s parent/guardian has also provided consent. 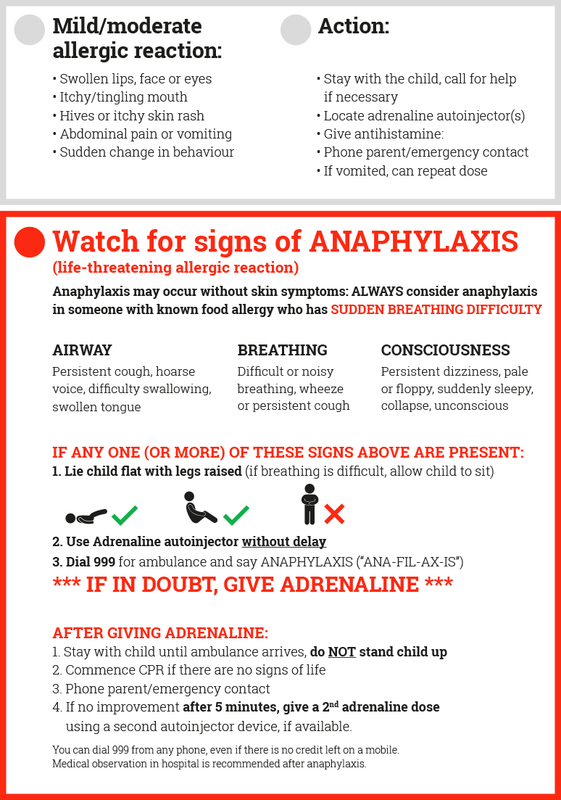 Although most mild reactions resolve, occasionally they can worsen and turn into anaphylaxis: anyone having a mild-moderate (non-anaphylaxis) reaction should be monitored (e.g. in the first aid area) for any progression in symptoms. A dose of adrenaline administered with an AAI into the outer mid-thigh muscle is safe and can be lifesaving. School staff can administer either the pupil’s own AAI if available, or use the “spare” AAI, so long as the necessary consents are in place. If a child does not have an Individualised Healthcare Plan which includes both medical approval and consent from a parent/guardian, the school cannot administer the “spare” AAI. Parents therefore have a responsibility to ensure they provide the school with the required approvals. The British Society for Allergy and Clinical Immunology (BSACI) has produced a range of Allergy Plans which can be used for this purpose, and can be downloaded here. Do NOT move the child. Standing someone up with anaphylaxis can trigger cardiac arrest. Bring the AAI to the pupil, not the other way round. Provide reassurance. The child should lie down with their legs raised (if the student is pregnant, lie on their left hand side). If breathing is difficult, allow the child to sit. Use the AAI first, then dial 999 – even if the child is feeling better. A person receiving an adrenaline injection should always be taken to hospital for monitoring afterwards. Use another AAI device – AAI devices are single-use only. This can be the child’s own device, or the school’s “spare” AAI. If a second dose is given, call the emergency services again to confirm that an ambulance has been dispatched. Note in the school’s records where and when the REACTION took place (e.g. PE lesson, playground, classroom), how much medicine was given, and by whom.